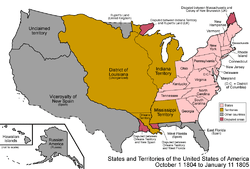 The District of Louisiana, or Louisiana District, was an official, temporary, United States government designation for the portion of the Louisiana Purchase that had not been organized into the Orleans Territory. It officially existed from March 10, 1804 until July 4, 1805, when it was incorporated as the Louisiana Territory. In legislation enacted October 31, 1803, Congress made provisions for a temporary government of the territory purchased from France. The President was authorized to use military forces to maintain order, although local civil government was to continue as it had under French and Spanish rule. 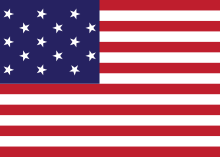 ↑ "An Act to enable the President of the United States to take possession of the territories ceded by France to the United States, by the treaty concluded at Paris, on the thirtieth of April last; and for the temporary government thereof"
↑ "An Act further providing for the government of the district of Louisiana"